Physical/ Habitat Description - Much of Wheatley Lake is shallow with the deepest part being down near the dam. In recent years, submerged aquatic vegetation has increased around the perimeter of the lake which may make it a little harder to fish from some of the shoreline areas, but is good for the fish population. Fish Species - Species that are present in Wheatley Lake include largemouth bass, bluegill, redear sunfish, black crappie, channel catfish and seasonally stocked rainbow trout. 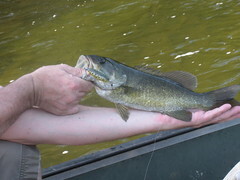 Restrictions - This area is designated a Catch and Release Bass Fishing Area which means you must immediately release any largemouth or smallmouth bass into the water where it was caught. For more information, consult the Maryland Guide to Fishing and Crabbing. History - Operated by the Charles County Department of Recreation, Wheatley Lake, also known as Gilbert Run, was constructed as one of three flood water management impoundments in the 1960's and 70's. Of the three structures, Wheatley was also designated as a "multi-purpose" structure which would allow it to be used as a recreational facility in addition to providing flood and watershed protection. The main source of water for the lake is Wheatley Run, part of the Gilbert Swamp Run drainage. Gilbert Swamp Run flows into the Wicomico River which eventually enters the Potomac River near Cobb Island.